Today, I'd like to highlight a very short lived women's fashion, the "Deseret Costume." Shortly after the Mormons arrived in Salt Lake City, Brigham Young set about the idea of designing an outfit that women in the religion should wear as distinctive attire that could set them apart from non-Mormon women. The result was the outfit pictured above. It consisted of a short dress falling between about halfway between the knee and ankle and worn with long pantalets, made of the same material as the dress itself. Over this dress was worn a long, loose hiplength jacket (or sacque), of antelope skin. To complete the look, Young added a hat, eight inches high with a narrow brim, that was expected to be worn when donning the attire. 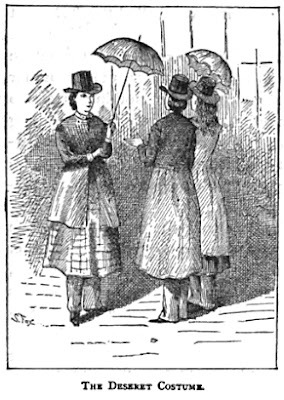 Mormon women, except for the most devoted followers of Brigham Young, soon abandoned this recommendation and returned to less masculine attire. However, in time, even the most devoted decided against this outfit. It was said that the high hat was the most objectionable part for the women. I had to look op ‘deseret’. Apperently ,there was a proposal for a large Mormon state named ‘State of Deseret’ in the mid 1800s. Also one of my favourite Nilsson songs is ‘Beehive state’. I now know that deseret means honeybee, hence the nickname of Utah is the Beehive State. I am curious - where did you find this image? And do you know the original source? Michael, this image comes from an older edition of Wife No. 19 by Ann Eliza Young.